Nowadays, most software is designed for thousands of users around the world. With the rapidly developing interaction between people, cultures, and countries through the growth of international trade, the demand for globalized software products has increased tremendously in the market. Software that was developed for multiple languages called “globalized software”. Globalized software can run independently of its topographical, cultural and national environment. Many IT companies now recognize the benefits of creating globalized software, users all around the world with their own language, culture can use their product without any difficulty, and that can make the product become more competitive to others. In today’s scenario, the world has become a Global village, more and more globalized product have been created to serve the need of the market. And, this is where Globalization testing comes into the picture. Globalization testing is performed to ensure whether the product/service deployed is properly functioning for any selected culture/locale. This is a technique which validates whether an application acknowledges all the language input text and still worked as designed when the user changed the language. The sole aim of globalization testing is to uncover the potential problem that could hinder the globalization of the app in an application design that may increase the costs of localization and future product support later on. Internationalization testing aims to ensure whether the application is adaptable to various languages and geographic regions without the need for internal redesign. The key target of I18N testing is to detect issues and loopholes in the software that could affect the quality of the product, verify if the code can deal with all the international support with no breaking of functionality that may cause data loss or data integrity issues. Language Compatibility Testing: Verifying if the product can behave correctly in a particular language environment. Functionality Testing: Regression test over different language environments and entering native language strings. Also, the tester needs to check whether the culture-specific info like currency, date, time format, time zone, weight and measure, right-to-left languages are displayed correctly or not. UI Validation: Identify any visual problem like graphical issues, text overlapping, test truncation, etc. Usability Testing: How easy can user from others country can use the product. Installation Testing: Trying to install the app in different native languages and see if all the installation messages are displayed correctly across the language settings. Image format testing: in a given culture, what may be viewed as sensitive or can be misinterpreted. The main aim of this testing is to make the product look and feel like it’s specially created for the target audience, therefore, make sure there are no defects and gaps in the software which can impact the proper functioning odd the UI. Additionally, it is performed to examine the standard of the product for a particular locale or culture. Combining both, I18N testing and L10N testing referred to as globalization testing. Globalization is at a broader level, Internationalization is making the application such that it supports multiple language/locales. Localization is making an application support a particular locale and language. User interface: Some language scripts have a different writing style (few are written from left to right and few are from right to left direction), also, some languages that do not use the Latin characters might require more space than languages that are written by Latin. Tester has to check if there are any issues appeared when changing to other languages such as text overlapping, misalignment of text, navigation issues, etc. Date and time notation: The date and time format will vary from region to region. Some might use the DD/MM/YYYY format, and some might use the YY/MM/DD format… This is the most common issues can find in the globalized product. Date time correctness: Not just checking the format but also have to make sure the actual date and time varies from region to region depending upon the time zone. Currency format and conversion rates handling: With different country, there will be different currency format. Phone number, address and zip code format: make sure the address, phone number or zip code is displayed varies from one language to another. Also, some function might not work correctly as expected without English settings, one simple example: the issue caused by the API. When they designed the API, they forgot to make the agreement for data format, one is using the English language and one is using local format. Why do we need Globalization testing? Besides the fact that more and more products are getting globalized make globalization testing become popular. Why we really need this testing? Faster time-to-market, Globalization test usually started the same time as normal testing. How to approach Globalization Testing? Code designed to be used on legacy platforms. Particularly platforms or components that handle text data in non-Unicode encodings. Some of them can be identified as those calling non-Unicode functions of the Microsoft Win32 application programming interface (API). Network components or components with console output are assumed to be in this area. Components using standard C run-time (CRT) libraries to handle text input/output (I/O) belong to this group, too. Components that extensively handle test data. Applications using files for data storage and data exchange. Components that have had man globalization problems in the past. Globalizing your test data: as said, a different language will have a different writing style. Edit the test data you have created before to fit in the language you’re going to test. You might need to pay attention to the sorting procedure, or converts the case of letters. The most serious globalization problem is functionality loss. Question mark (????) appearing instead of the displayed text indicates problems in Unicode-to-code-page conversion. Random characters (¼, «, †, ‰, ‡, ¶, and so on) appearing instead of the readable text indicates that the code page-based code is using the wrong code page. Selected font cannot display some of the characters. Also, remember that language settings cannot all locale-specific functionality. For example, you cannot see the current sort order there. Therefore, it’s important to create a test plan that covering all aspects of functionality related to locale before you start your test. Ensure if the required installations are being done to set up the test environment. Verify if the user manuals/help files are displayed in the native language as per the client’s locale. 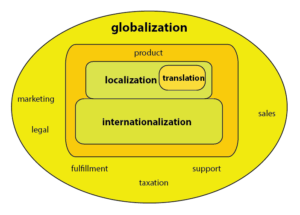 As a final note regarding globalized testing, when planning and running testing always remember that globalization is wider in scope than just supporting one particular language. The test you use to verify that code has been globalized might not seem to duplicate a realistic usage scenario; that is, the settings of a particular globalized test may look a bit unnatural. Major challenge is the translation. It’s difficult for tester without knowing the language they need to test. Styling indents, line paces, alignment (vertical and horizontal) issues. Applying Globalization testing to test your Globalized product to ensure the quality of your product before release to the global audience. If you want your product to be accepted by users from many countries, then you should not skip this testing in your testing process. With this test, you not only checking for the world-readiness but also checking for general core functionalities. A Globalized product that has been tested for its globalization capability will help your company stand out from others competitive, reduces overall testing and support costs later on.